In the last two decades, sustainability has taken centre stage within the property sector. The link between sustainable assets and a so-called ‘green premium’ remains something of a holy grail, but there is compelling evidence of the existence of a ‘brown discount’. While research suggests that the most sustainable corporations experience improved financial performance, operational cost savings associated with efficiency improvements and renewable energy are plain for all to see. Yet, with a dizzying number of certifications schemes and benchmarks, companies are often unsure which ones will bring the most value to their investments. Faced with stricter regulations, pressure from investors and issues around resource scarcity, decisions have to be taken, and fast. Large property companies tend to have large, varied portfolios that sometimes even span multiple countries. To manage these portfolios, they often use centralised governance policies that promote social and environmental stewardship across their assets. However, as the assets often vary in type, size, function and geographic location, a gap begins to form between the portfolio-wide targets and the actual performance of the individual assets. 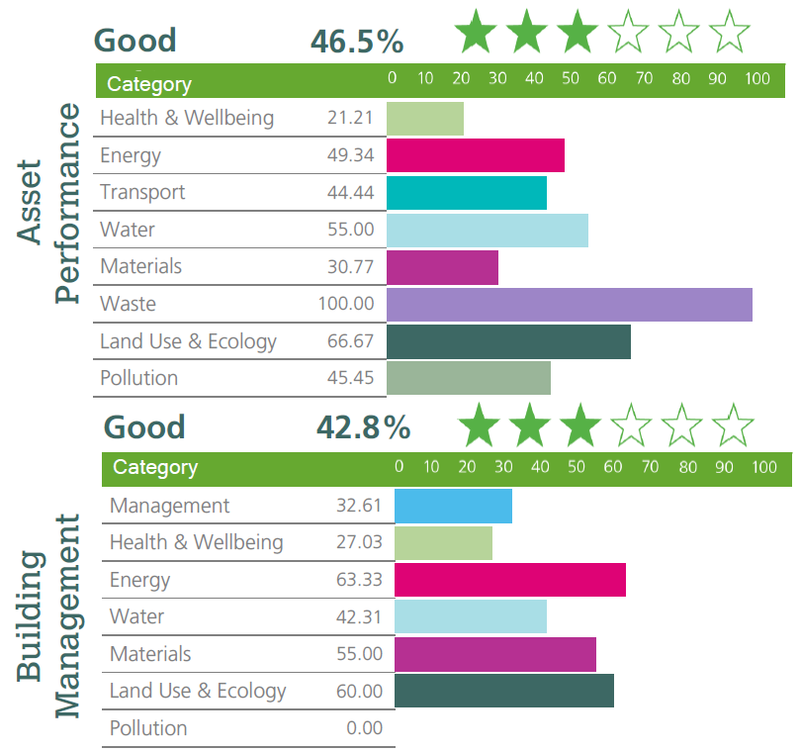 I argue that BREEAM In-Use can be used to fill this performance gap while providing owners and occupiers with a clear and effective way to assess, monitor and add value to their portfolios. 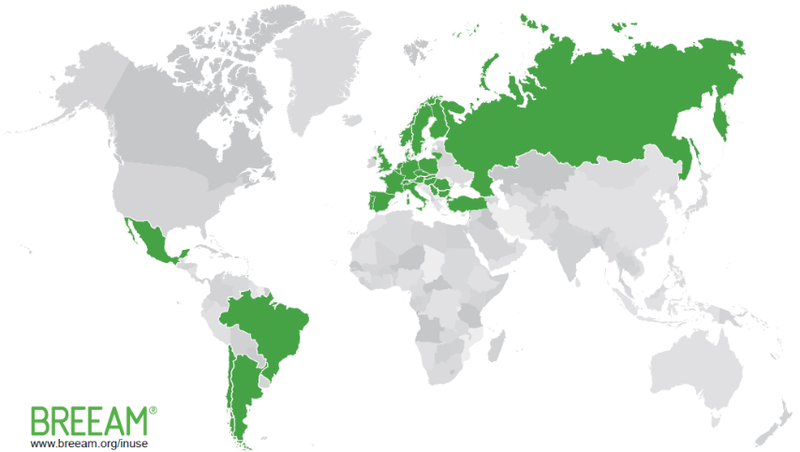 BREEAM In-Use is a certification system used to assess the sustainability performance of non-domestic existing buildings. Introduced in 2009 by the Building Research Establishment, the assessment tool has been used to assess over 10 million m2 of internal building space in over 30 countries and has established itself as the most widely used certification for existing buildings (see Figure 1). 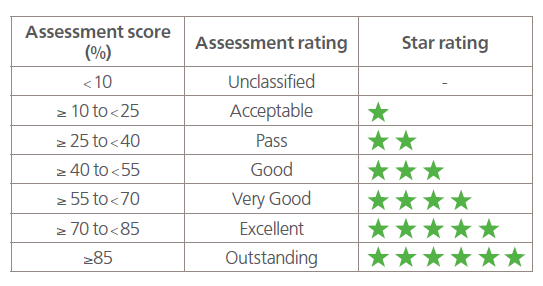 BREEAM In-Use assessments are categorised by a six star-rating system, ranging from a score of Acceptable to Outstanding, as shown in the Figure 2 below. Unlike most building certifications, there are no prerequisites and buildings do not necessarily have to be “green” to be certified. This is key in establishing portfolio-wide coverage for assets that vary significantly in environmental performance. Redevco and VIA Outlets are two large property funds that have already seen the value of such an approach by successfully assessing their entire portfolios to BREEAM In-Use. To date, statistics reveal that the certification has been mainly utilised to assess retail and office buildings with most assets achieving a score of Good. BREEAM In-Use, through its three-part structure, can be applied to assess: (1) the actual performance of an asset, (2) the management of an asset, and (3) its tenants. It captures data across nine key sustainability categories. Indeed, after the initial certification, the asset not only receives a final score for each part but also a score for each of the nine key categories (see Figure 3). The nine key categories can be used as KPIs to benchmark and monitor the environmental performance of an asset over time. This same idea can be expanded to monitor not merely the performance of a single asset over time but that of an entire portfolio. BREEAM In-Use thus offers property owners a standardized method of assessing the performance of a range of buildings to identify underperforming assets, implement improvement plans and even assess the performance of their asset managers. An existing asset certified with a rating of ‘Very Good’ (or better) is also Green Bond compliant. As a result, property companies applying the BREEAM In-Use certification to their portfolios not only increase their resilience but also open the door to a wider range of investment types. BREEAM In-Use represents an internationally recognised third party accreditation that can increase a property’s asset value while identifying asset-level improvement plans. These benefits have been well-documented and remain attractive, but in truth, leave the certification underutilised. At a portfolio level, BREEAM In-Use can be an extremely effective management tool, providing a clear roadmap by which to raise the sustainability performance of the whole portfolio, while increasing access to capital. This is why, moving forward, property companies should look beyond the single certification and aim to fill the performance gap by applying BREEAM In-Use to assess, monitor and add value to their entire portfolios. For more information on sustainable portfolio management and BREEAM In-Use, get in touch with Longevity Partners at axk@longevity.co.uk.